i saw this before and after on design sponge and decided i was going to do something similar. we have the horrendously ugly (but also quite cool) brown samsonite suitcase that would be used* if it wasn't such a gross color. so apparently i am going on a hunt for wallpaper and also modge podge. i guess the hunt for the latter will be easier, but still makes me nervous as i have never used that stuff. i imagine this project will take place this weekend so pictures might be in the future. 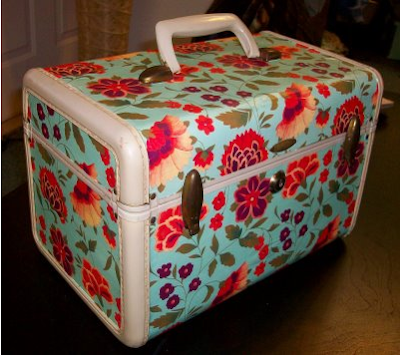 *use as in look pretty somewhere in our house because honestly it is a pretty poor suitcase. Love this. I wish I was craftier. Anything that can't be done with a glue stick is beyond my skill level unfortunately. So cute bag. Looks awesome! skipping monday is my favorite thing.